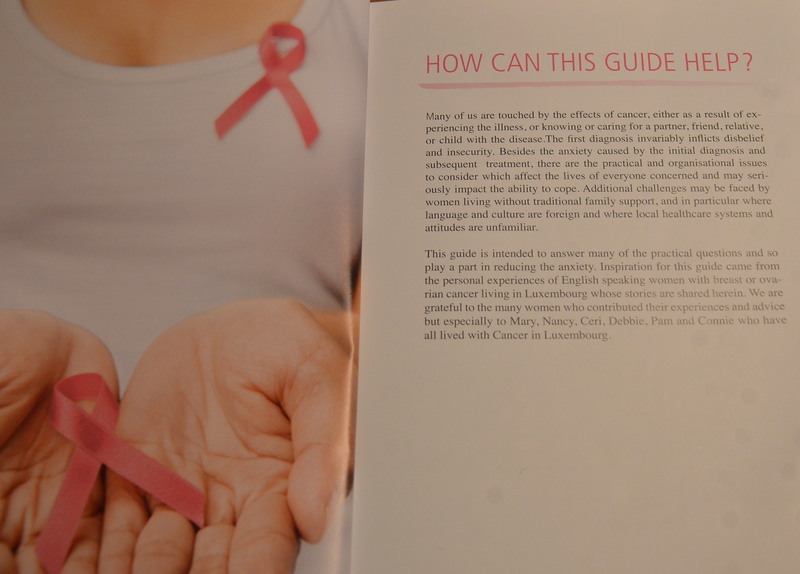 On January 23, Think Pink Lux launched “The Think Pink Guide” on living in Luxembourg with cancer. According to the World Health Organization, breast cancer is the leading cancer killer among women aged 20–59 years in high-income countries. They do everything they can to support women battling breast cancer in a country that is not their native one, to raise awareness and to provide information – all in English. Their motivation is a strong commitment to the cause, and some have their own personal cancer story. They continuously think pink, and they have strong support in among others the Ministry of Health, who understands that it’s hard to be away from home when cancer strikes, and who believes in the importance of sticking together to get women through breast cancer. One result of this commitment is the new guide, in which courageous cancer survivors have shared their experiences. It gives you advice on how to deal with medical issues, insurance, convalescence and other practicalities. It helps you remember all the questions you need to ask, and explains words you need to know. It deals with the wig issue, and it focuses on your wellbeing. Like laughter and good friends. It helps you find the words to say to your near and dear ones. On top of that, it has a neat size and beautiful illustrations. One of the stories is Ceri’s. It’s the story of a 38-year old woman and mother of a 2-year old who, following a routine check-up, heard the dreaded word cancer. In the mental chaos such a word creates, she also picked up encouraging words; “small”, “early”. “This was the topic of conversation around our dinner table for a year – two years”. There were positive things; spending more time with her son, letting him loose on her hair when she was losing it, choosing a wig with a good friend – afterwards she has been that friend to others, in a special kind of sisterhood. The health service in Luxembourg was another positive experience. A key message from Ceri is to have a conversation with your family to know the complete family history, in order to detect cancer as early as possible. Would you like to think actively pink? There are many ways to volunteer; you can donate, advocate, or participate in or organize events. You can also join the pink wave in Relais pour la Vie or the ING Marathon. Sponsorship from last year’s marathon funded the guide, as well as €21,000 worth of cancer research. Learn more about Think Pink Lux.